The MF team tries to regularly attend art exhibitions in Switzerland to keep ourselves inspired for upcoming projects. Our most recent venture: the Qubibi exhibit at MuDA. Technology is at the centre of everything we do at Media Frontier, from the products we produce for clients, to the digital strategies we develop, to our daily process of creating in front of a multitude of screens. 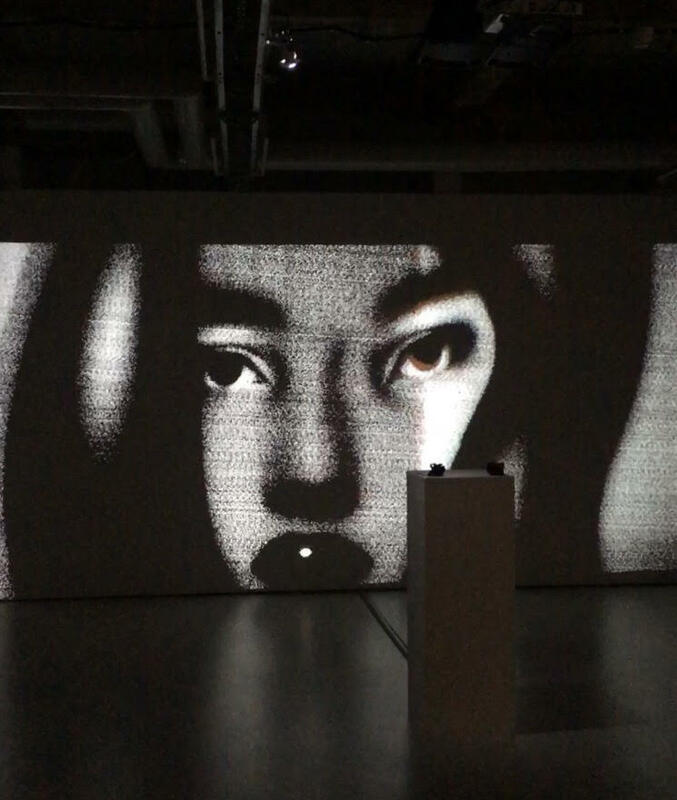 Japanese artist Qubibi’s current exhibition at the Museum of Digital Art (MuDA) in Zurich translates his daily relationship with technology into an interactive, living exhibition. It’s a fascinating visit, relevant to all of us in the digital age. Quibibi’s exhibit is a fully immersive and interactive funhouse… with a dark side. Slipping behind the thick black curtains, viewers explore and experiment with several installments between a series of rooms. Most installments are sensitive to either sound or touch, often morphing and changing shape in reaction to the viewer. In one screen, a multitude of illustrated “Quibibis” merge and separate as they scramble across the screen. In another, museum-goers rouse slumbering people with the tap of a mouse, thus waking both the computer and the person. On one suspended touchscreen, poking at the colourful figure on display prompts them to frantically attempt to brush off the sudsy bubbles multiplying over their body. All have an accompaniment of interesting electronic sounds. The exhibit plays with the lines between digital and daily life, showing a very personal yet relatable relationship between artist/viewer and digital/screens. The final room features a screen spanning the entire wall and morphing between different colourful and black and white blobs (see header image). Quibibi’s algorithm works so that the piece never makes the same pattern twice. As you exit the exhibit you can put a franc into a vending machine to print out a one of a kind pattern to take home with you. The experience is fascinating and absorbing but also manic. After 30 minutes inside the dimly lit buzzing rooms, I questioned if I was in a museum or an insane asylum. And yet, the experience is really just a heightened version of most of our daily realities. The exhibit does an excellent job of both inspiring new, artistic uses for technology, and also driving you to get up from your desk, go outside, and enjoy a screen-free walk in the fresh air. Qubibi0’s solo exhibition is on display at MuDA until January 28th, 2017. Qubibi, also known as Kazumasa Teshigawara, is an artist and designer, born in Tokyo in 1977. Can machines be emotional? The exhibition by Qubibi is more than sentimental. Using zeros and ones, the self-taught programmer creates artworks that have the power to move the soul. Having himself a somewhat difficult past, Qubibi uses his struggles in life as raw material to build touching digital artworks in his first ever solo exhibition. He used to live with his mother in the beginning. Later moved in with a new family. Was taken around bars while still young. Hostesses used to like him a lot. Stopped going to school. Played games at home. Cried out of fear when collectors banged at the door for money. Father ran away, got caught. Graduated elementary school. Got into an accident and hurt his neck. Father came back. Father died. Graduated secondary high. Worked at a textile factory. Got into an accident, almost died, and hurt his neck, again. Got into music. Bought a computer. Met some weird people. Said goodbye. Unknowingly entered a bad content design firm and quit immediately. Was scared for days after he quit because the company got hold of him. Worked and quit a number of jobs. At age 21, discovered the fun of design. Eventually Qubibi got married and became a father. Then separated. Got the kid. Takes care of the kid. Media Frontier perpetually searches for new and innovative uses for technology, as well as fresh ways to use digital tools to tell brand stories. Our international team offers a wide breadth of services, including concept, design, development, and event coordination. Contact us today to have a chat about how we can best serve your upcoming project.